With The Hobbit: The Battle Of The Five Armies almost upon us, the world has nearly seen the last Lord Of The Rings-based movie it may ever see. Well, at least until Peter Jackson gets desperate and turns The Silmarillion or The Children of Húrin into their own trilogies, which we expect to happen in the next year or two. Anyway, New Zealand—being the country where Jackson has filmed his J.R.R. Tolkien adaptations—isn’t ready to let the movies go just yet. After all, there are countless nerds out there who would love an opportunity to take pilgrimages to the magical land of New Zealand so they can see the lovely green fields of Rohan, the breathtaking cliffs of the Misty Mountains, and the beautiful black tower of Barad-dûr—home to Sauron, the Dark Lord Of New Zealand. Now, with all of these people taking Hobbit-related vacations, Air New Zealand has decided to release an instructional video that presents airplane safety in a way that’s not only more relatable for the modern Tolkien fan, but just as exciting as the most thrilling battle in any movie. Well, that’s what Air New Zealand is hoping they’ll think, at least. 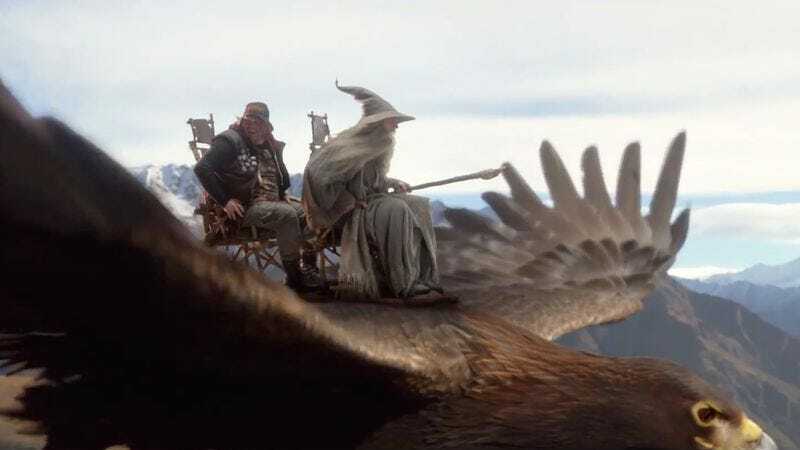 Dubbed “The Most Epic Safety Video Ever Made,” it shows various people in Lord Of The Rings costumes—some of them Lord Of The Rings actors—talking about the proper way to put on a seatbelt or an oxygen mask. It’s all very knowingly silly, but Air New Zealand seems to have put in a good amount of work actually turning the video into its own kind of advertisement for the fabulous sights of its country. There’s even a climactic battle of cheerful greetings and friendly hugs, just like in the movies. Also, Air New Zealand did a similar Hobbit-themed video in 2012, but this one is a bit more entertaining.